She's back. Annabelle: Creation, directed by Lights Out's David F. Sandberg, is creeping into cinemas on August 11. To celebrate the return of the terrifying doll we first saw in The Conjuring, James Wan and the creators of The Conjuring Universe are looking for fans to submit a short horror film. And to help you along the way, David F. Sanberg has some tips on how to make your short film stand out! Submit your short film - and we do mean short at no more than 2 minutes in duration - inspired by The Conjuring Universe and the upcoming film Annabelle: Creation right here to be in with a chance to win a horrifyingly exclusive prize. 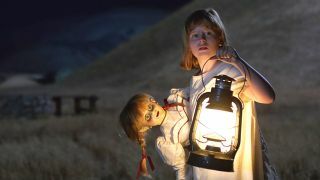 The top filmmaker will receive a trip to Los Angeles to meet with the director of Annabelle: Creation, David F. Sandberg, or an executive from New Line Cinema. Your film must be submitted by 11:59 pm BST on 7 August 2017. Your video must be approximately 2 minutes in length. You can post your videos to social media using the “Share” feature on the contest site and including the hashtags #MyAnnabelleCreation, #AnnabelleCreation and #Contest with your post. You may submit your videos between 18th of July 2017 and 11:59:59 pm BST on the 7th of August 2017. By entering this Competition, you agree that your video can be posted in an online gallery, it can be selected as "bonus" content included within the home video release and may be used for marketing and promotional purposes on a global basis. By entering this Competition, and for up to three years afterwards, you grant Warner Bros. and New Line Cinema the exclusive right to choose to purchase all rights in your video, including the right to adapt it into a feature film or other audiovisual work in exchange for USD $1000. This means you cannot allow anyone else to buy or use your video, and cannot change your mind about giving Warner Bros. and New Line Cinema this right to buy. Your obligation to grant this option ends approximately 3 months after winner verification in this competition. Before you get going, David F. Sandberg has a short message and some top tips on how to create a great horror. Remember to watch his short Lights Out for some truly spine chilling inspiration and keep an eye on our social channels and this page for more tips from Sandberg as the competition progresses. Spoiler: Be scary. In case you need some inspiration, Annabelle: Creation goes back to origins of the evil doll, long before she ended up in the Warrens' basement complete with a do not touch label. Several years after the tragic death of their little girl, a dollmaker and his wife welcome a nun and several girls from an orphanage into their home. Unfortunately they become the target of the dollmaker's possessed creation Annabelle. It's not going to be pretty. The movie stars Stephanie Sigman, Talitha Bateman, Lulu Wilson and Mirando Otto, and with Sandberg on directing credits and script from original Annabelle's Gary Dauberman, Creation promises to be serious nightmare fuel. Good luck. Closing date 11:59:59 pm BST on the 7th of August 2017.